Short sleeve shirt / top with pink lace detail. Dress with floral print and bare shoulders detail. 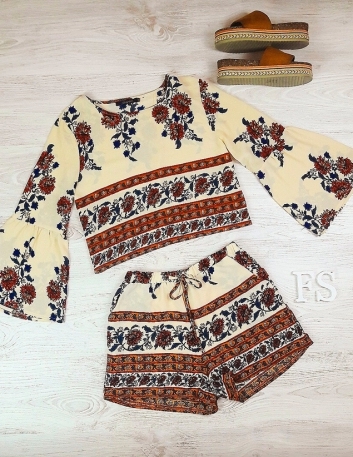 Floral and ethnic set of shirt and shorts with lacing. Two-tone long jumpsuit with V-neckline. Midi dress with V neckline, tube skirt and waist flap detail with polka dot print and yellow and mauve flowers. Skirt made in crepe with detail of front cut tie and back zipper. Dress made of crepe with floral print and detail of bows on the chest. It has a rear zipper. Long white satin jumpsuit printed with large tropical leaves. It contains a belt. Long jumpsuit with a pinstripe down to the ground in a hood, a v-neck and belt. Striped satin blouse with black lace at the neckline. Crepe dress with open back, V-neckline and gauze detail. Dress made of red crepe with a sweetheart neckline. It has a side zipper. Skirt made of floral crepe with lateral fleece detail and rear zipper.